Big Is Beautiful – India, Ink. I’m afraid I know nothing about any of the programs you’ve mentioned (besides WordPerfect), as they’re all Windows applications. Since your budget is minimal, though, you might want to add Scribus to the list of layout programs you’re considering. It’s free and open source, and I’ve heard great things about it. The website’s not flashy, but you can’t beat free; also, open-source software tends to have lots of extremely fervent (also free) tech support—there are thousands of other users who’ll be eager to help you via discussion boards and e-mail lists, and you can often correspond directly with the programmers. Another open-source option is one of the many Windows implementations of LaTeX, such as LEd. LaTeX has an utterly rabid following, so there are tons of websites and discussion lists (and books) where you can get help. I’ve used only a tiny part of it, to set math equations, and that on a Mac, but it seemed to deserve its reputation for being fast and powerful. All modern applications should be able to read .rtf files, since it’s a cross-platform standard. For .wpd files, as I learned last week, they can be easily converted to more common formats using Abiword, which is free and available for Windows. So I wouldn’t make that a criterion when choosing your layout software. Instead, find a program whose interface makes sense to you and that fits your budget. Endnotes shouldn’t require any specialized software, unless you expect them to need renumbering. This usually happens only if the text is being substantively edited, so I wouldn’t expect it to be an issue with reprints. It’s footnotes that are the real headache, as they have to stay with the text to which they apply. Indexing is a highly specialized skill—a great indexer is born, not made, I suspect—and most indexing is done by professionals, working from PDFs or hard copy page proofs, and inserted as a separate document. The benefit of creating an index within your layout software is that the page references get updated automatically if the pagination changes. This is most useful if you plan to issue a book in several formats—e.g., a large hardback, a small paperback, an interactive PDF, and HTML. A good index is not just a concordance of key words, however; it’s an editorially informed, reader-oriented document in its own right. So a big drawback to indexing in the layout program—assuming you can even find an indexer who will do it—is that the index is then harder to write and edit properly. And if you’re hoping that republishing these quarterlies as books will make them more useful to researchers, a well-edited index is key. So unless there’s a good reason, I wouldn’t bother looking for layout software that can track index entries. If you hire a professional indexer, that person will have his or her own preferred software and method. . . . Finally, regarding large-print books, sadly I have no experience here. I’ve written to the National Association for Visually Handicapped to ask what their standards are; I’ll let you know if they give me the details. In the meantime, it seems that 16-point type is the minimum, though 18-point is preferred. Of course, point size is kind of meaningless, as how a particular font looks at that size depends entirely on which typeface is used. So, as an alternate measurement, this book recommends a font wherein the lowercase o measures approximately 2.7 millimeters. Anybody have some more informed advice? No edition may exceed an overall size of 8-3/4″ × 11-1/4″, with a maximum sheet size of 8-1/2″ × 11″. An off-white or natural vellum or matt offset stock must be used to prevent glare. Gutter margins should not be less than 7/8″, with the outside margin smaller, but not less than 1/2″. Type size should not be smaller than 16 point—preferably an 18 point type should be maintained. Letter spacing, word spacing and leading must be adequate in order to avoid crowded copy, as white space is of utmost importance to many of the visually impaired. Density is extremely important, and copy that appears grey will not be acceptable. The binding shall allow for as much flexibility as possible, with the hope that a loose spine will be employed in order to allow the book to lie as flat as possible. It is recommended that all books be side sewn for durability. A vertical line must be used to separate columns. If photographically enlarged from the original edition, broken letters must be avoided. Careful scrutiny of selections should be made either by the editorial department of the respective publisher, or NAVH will offer this service if small print editions are sent to us prior to the enlarging process. Headlines must be bold and, if color is used, it is recommended that either bright yellow or orange background with bold black type be employed. 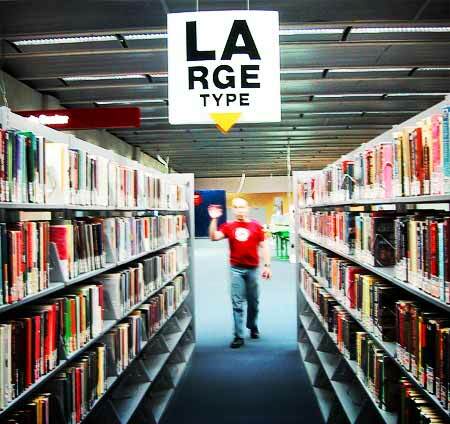 Because the majority of those who require large print have central vision impairment (primarily macular degeneration) unless good contrast is offered, many will be unable to benefit from the publication. . . .
Photo: LARGE TYPE with Jordan by jessamyn west; some rights reserved. Next Post The future of publishing is here today! Excellent comments about indexing. There are a few indexers who will work in layout programs, placing tags. In addition to the benefits you mentioned, indexing that way means the indexer doesn’t necessarily have to wait for that final set of page proofs before starting the index. The drawback, which you alluded to, is that indexing features of layout programs (or of Word, for that matter) are not very powerful or versatile. Working that way is painfully limiting, I’m afraid. Most of us professional indexers use one of 3 stand-alone indexing programs: Cindex, Macrex, or SKY. Thanks so much for commenting, Carol! Good to know that I wasn’t completely making that stuff up. I’ve edited and typeset a lot of indexes but written only two—enough to have immense respect for professional indexers, and to know that I shouldn’t do it again myself! My second index was for a book that was being produced by a university press using their brand! new! shiny! XML workflow, of which they had high hopes. I received hard copy and was instructed to circle the anchor word for each index reference and number them sequentially in the margin. So the index entries were keyed to points in the text instead of to page numbers, much as they would have been had the index been done in Word or XPress. Because the publisher didn’t need to wait for page proofs to create this kind of index, they had me working at the same time that the copy editor was cleaning up the book. I therefore had a much later, more flexible deadline than one usually does for indexing, but I was working on dirty copy. This was on a long, dense theater history book that contained thousands of show titles, song titles, and personal names. So the supposed benefit of not having to wait for page proofs was completely outweighed by my having to fact-check half of those names in order to determine whether they belonged in separate entries. I was in near-daily correspondence with the copy editor after a while, sending her lists of names and titles that I’d already checked, so that she wouldn’t have to duplicate my effort. And this modern time-saver became exceptionally expensive for the publisher and authors (who split the cost of the index between them), since given all the extra work that was required, I had to charge an hourly rather than a per-page rate. At the end of the process, I wrote to the editor explaining the severe drawbacks of this portion of their workflow. I don’t know if they ended up altering it, but she seemed to take my comments pretty seriously. Ever since, I’ve been skeptical of the idea that indexing a book at the word-processing or first-pass stage is advantageous. I suspect that the supposed time savings often ends up getting devoured by additional corrections, and I believe the quality of the index suffers, as well, since working around so many typos and inconsistencies can be awfully distracting. I’d be very interested to hear more about how new technology has changed the way indexers work, and whether there have been any real improvements.